Treat your family to this appetizing, healthy Salmon Chowder (above). In Norway this delicious seafood chowder is made with Atlantic Salmon, which is plentyful in our cold waters, but other types of salmon will work fine. Accompanied with baguettes, herb butter and a salad of spring greens will make this beautiful seafood meal fit for royalty. Get the applause! 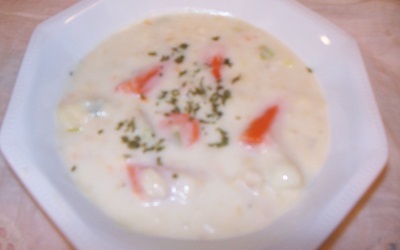 Make a double recipe of this delicious fish chowder recipe and freeze some for later. Sauté onions and garlic until transparent. Place potatoes, carrots, water, bouillon cube and salt into a soup kettle and simmer for 15 minutes. Add remainder of vegetables and simmer. In a separate bowl whisk instant potatoes and milk. Add this gradually while stirring. Add fish and stir until soup thickens. Lower the heat. Crumble the fish into smaller pieces when it is cooked. Add cream gradually while stirring. Season with freshly ground pepper, Worcestershire and salt to taste. Turn heat off and let rest for a few minutes. Garnish the Salmon Chowder with fresh chives before serving.